Well-versed campers are comfort experts, and one item they don’t compromise on is a sleeping mattress. Unlike backpacking where weight and packed size are limitations, car camping mats put a premium on plush cushioning and support with thick foam and soft touch materials. Below are the best camping mattresses and pads of 2019, ranging from versatile self-inflating mats and air pads to luxurious airbeds and cots. For background information, see our comparison table and buying advice. And to complete your camping kit, we’ve also tested and written about camping tents and sleeping bags. Weight: 5 lbs. 8 oz. What we like: Pure camping luxury. What we don’t: Heavy and not everyone needs this much cushioning. The formula isn’t revolutionary—a self-inflating mat with a foam core—but the result is pure camping luxury. Most importantly, the MondoKing 3D is a substantial 4-inches thick and the vertical sidewalls allow you to enjoy every part of the soft 77- by 25-inch platform. The foam is plush and supportive, and the strong fabrics are soft to the touch and highly tear resistant. Further, the pad’s extremely high 11.4 R-value does a fantastic job of insulating you from cold ground. The MondoKing undoubtedly is expensive, but the high levels of comfort and quality are what put it at the top of our list. Given the choice between air and self-inflating pads, we find ourselves coming back to the tried-and-true original Therm-a-Rest design for its ease of use while car camping. Self-inflating pads mean no pump to bring along, and with the MondoKing it only takes a few breaths to get it just right. Yes, this mat is heavy and doesn’t pack down small—get an air model like the Nemo Cosmo 3D below if those are important considerations. But you won’t find a more comfortable or better-built camping pad. Keep in mind that the MondoKing comes in both an “L” and “XXL” size, with the latter measuring a whopping 80 x 30 inches. What we like: Excellent price to comfort ratio. What we don’t: One step down in comfort from the MondoKing. 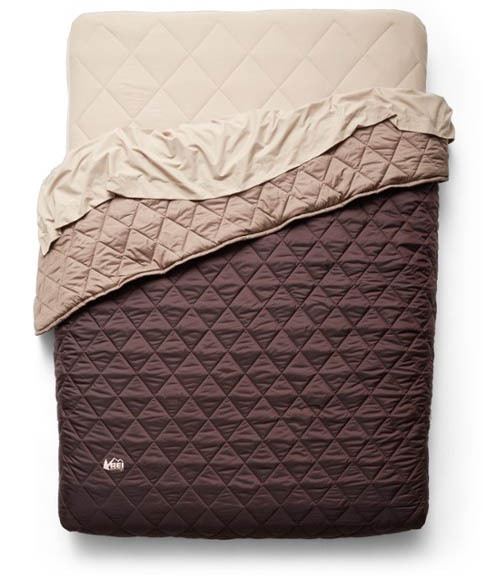 A favorite camping mat of ours for a number of years, the Camp Bed from REI wins you over with heaps of foam and a great price. While it’s a step down from the truly luxurious MondoKing that took our mattress crown, with 2.5 inches of thick padding and a high-efficiency valve that expedites the self-inflating and deflating processes, it’s no slouch. Soft-touch, stretchy fabric both holds you well and is comfortable enough to lie on directly if you’re camping in a hot environment. And an R-value of 5.8 makes the Camp Bed warm enough for 4-season use. REI updated the Camp Bed for 2019, and we’re sad to see the old 3.5-inch model is no longer available. That said, the mat is still a value leader at $100 for the regular size (stepping up to the 78 x 25 in. XL is $130), and all but the most discerning car campers will find it quite comfortable. 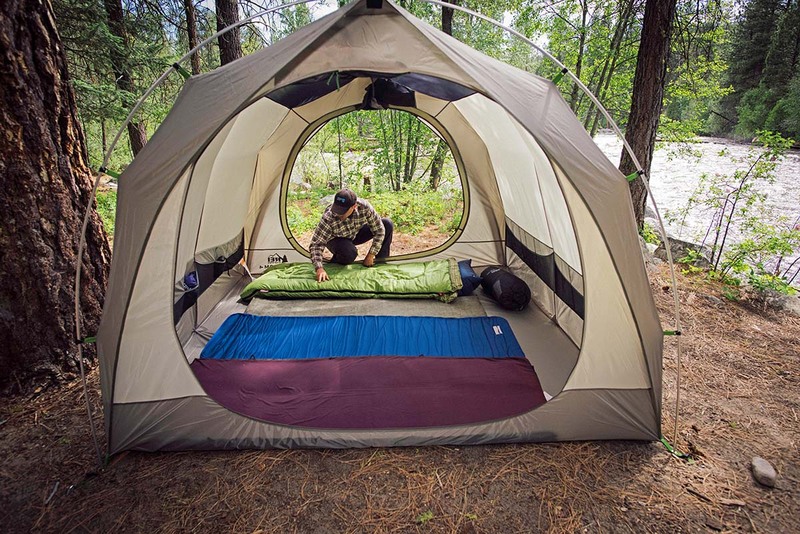 For a larger and truly plush self-inflating option from REI, check out their new Camp Dreamer, which is 4 inches thick, 55 inches wide, and features vertical side walls. Weight: 4 lbs. 14 oz. What we like: Great value and decent comfort. What we don’t: Value-oriented “regular” size is only 20 inches wide. It’s tough to find a decent self-inflating sleeping pad for under $80, but the Alps Mountaineering Apex Series accomplishes just that. Blending foam, air, and a tough polyester shell, the Apex provides good warmth and sufficient comfort for camping. A unique feature at this price point is the suede upper fabric, which is a big step up from the plasticky materials we’re used to seeing on a budget model (including Coleman’s Self-Inflating below). Not only is it enjoyable to lay on directly, but the grippy material helps keep you from sliding off the Apex during the night. For the price, the Alps’ self-inflating technology works well and the pad is durable enough to last for many seasons. Unfortunately, it’s a bit narrow at 20 inches wide for the regular size—stepping up to the “long” gets you 25 inches of width but a big jump in price to $100. And despite being a little thinner, we give the overall advantage in comfort to the higher quality REI above. But for the occasional camper, budget seeker, and/or back sleeper, this is all you’ll likely need for a good night’s sleep under the stars. 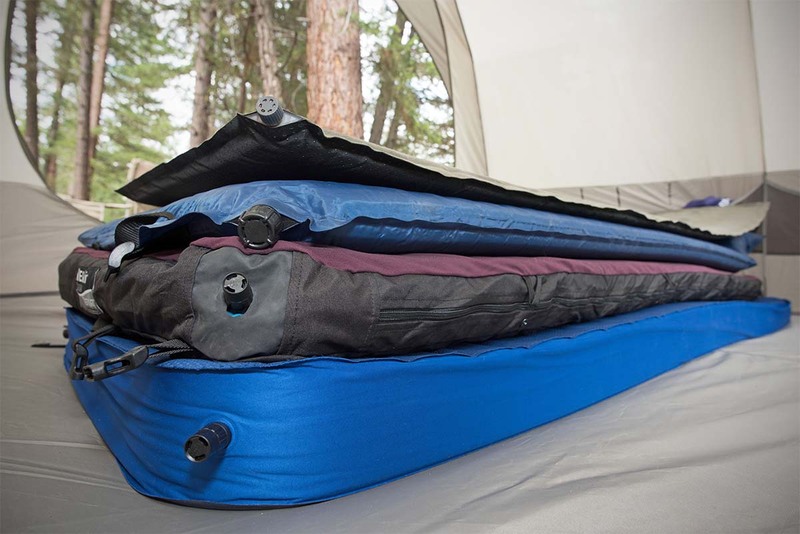 What we like: Airbed convenience along with a durable build. What we don’t: Takes up a lot of space in your tent. The mattresses above are designed for a single camper, but springing for a full-on airbed is great for couples, families, or those who just like the extra space. 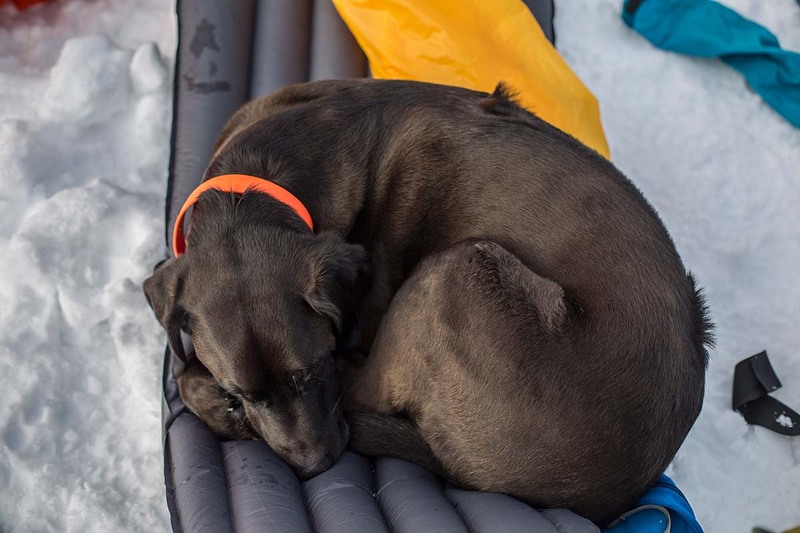 Our favorite outdoor-ready design is from SoundAsleep: their Camping Series airbed has proven to be durable, easy to inflate with a rechargeable pump, and impressively comfortable and supportive for the price. The fabric is strong enough to stand up to rough use (although it’s always a good idea to take good care of your mat), and the 9-inch height of the Camping Series is great for getting you off the ground without interfering with most camping tent walls. Additionally, it’s a solid value at under $100 for the queen version. What are the downsides of the SoundAsleep Camping Series? For one, we think overall comfort falls a little short of a pad with built-in foam like the MondoKing above (adding a foam mattress topper can help resolve this). And if you do happen to get a puncture, it can be a real pain trying to locate and fix a leak (again, this is unlikely to happen given the solid build). The Camping Series is offered in both a twin or queen size—we suggest springing for queen if you have the space as it’s only $10 more. Dimensions: 76 x 30 x 3.0 in. Weight: 1 lb. 10.5 oz. What we like: Fantastic value for a lightweight and comfy pad. What we don’t: Minimal insulation. Klymit broke into the sleeping pad scene with their wild looking Inertia pads that appealed to minimalist trekkers, but, more impressively, they really hit a cord with the mainstream camper and backpacker with the Static V series. These are pure air mats, with no foam in the construction. A benefit is a much smaller packed size, but it does lose some of the inherent structure and support when inflated. Klymit addresses this with a wide build with the “Luxe” model (30 inches vs. 25 inches for most camping pads) and side rails that keep you securely in place. The v-shaped air channels are quite comfortable, but we still give the edge to the foam options above. What really pushes the Static V Luxe up our list—leapfrogging pads like the Therm-a-Rest NeoAir Trekker and Nemo Cosmo below—is the price. At $80 for the Luxe model, it’s longer, wider, and a lot cheaper than the Trekker and Cosmo. If you don’t need much insulation from the ground (the R-value of 1.3 is for warm weather only), it’s a fantastic deal. For the same design but with a higher R-value, check out the Insulated Static V Luxe. Weight: 9 lbs. 14.7 oz. What we like: Extremely comfortable for two sleepers. What we don’t: Expensive and not as versatile as a one-person mat. Exped’s MegaMat Duo 10 combines the dimensions of a full size airbed with the luxurious comfort of a foam self-inflating pad. 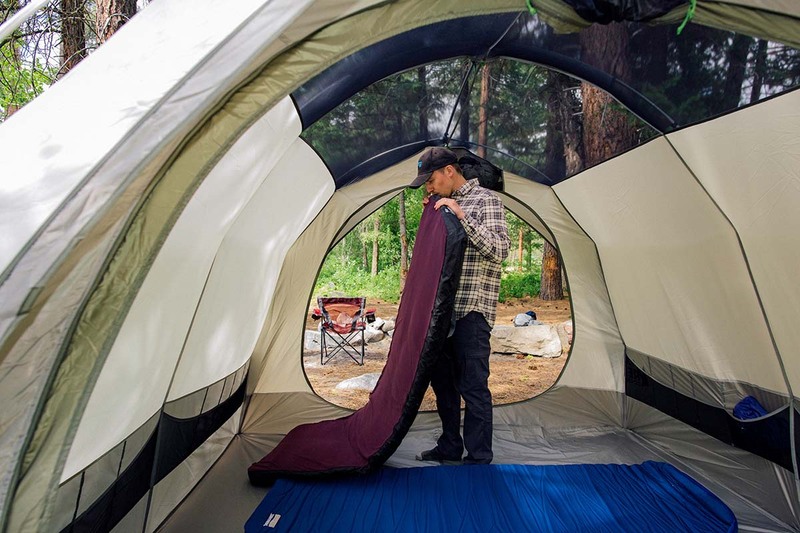 The net result is an excellent night’s sleep for two campers: the 3.9-inch thick cushioning and vertical side walls rival the Therm-a-Rest MondoKing above, but the one-person MondoKing can’t touch the Duo’s 52-inch width. With easy inflation/deflation via two large valves and a durable construction, the MegaMat checks off all the boxes for a pair of comfort-oriented campers. We have the MegaMat Duo 10 ranked here, however, because of its price and versatility. At $389, it’s by far the most expensive pad to make our list. The price tag makes more sense if you factor in purchasing two premium pads like the $180 MondoKing, but owning a double pad like the Duo can be overkill when camping by yourself (although too much room isn’t necessarily a bad thing). Thankfully, Exped also makes the MegaMat 10 in a standard width, although it too is spendy at $199. Weight: 2 lbs. 10 oz. What we like: Nice touches like a built-in pump and pillow. What we don’t: Step down in durability and comfort compared with self-inflating options. Similar to the Klymit above, the Nemo Cosmo 3D Insulated is a pure air mat—there’s no foam to be found in its construction. And while it can’t quite match their comfort—despite a new curved baffle shape for 2019—the Cosmo wins out in weight and packed size. In addition, we appreciate its built-in foot pump, which makes the cavernous, 3.5-inch thick design surprisingly easy to inflate (just make sure to take off your dirty shoes prior to pumping). Another unique feature of the Cosmo 3D is that the head end of the pad is raised, creating a pillow (a helpful feature if you forget yours at home). Opting for the insulated version gets you PrimaLoft synthetic fill bonded to the interior, which gives the Nemo mat an approximate temperature rating of 15° to 25°F. And a final bonus: with its fairly reasonable weight and packed size (especially in the “regular” length/width), the Cosmo 3D does the trick as a luxury backpacking sleeping pad. Dimensions: 79 x 56 x 6 in. Weight: 15 lbs. 9 oz. What we like: A true home-in-the-woods experience. What we don’t: Very expensive; slow hand pump. If the Therm-a-Rest MondoKing 3D above is like bringing your pillow top mattress on the road, the Kingdom Insulated Sleep System is like throwing in the box spring and bedding. A truly unique set-up, the Kingdom System starts as a quality 6-inch-tall queen-sized airbed (you can purchase just the Insulated Airbed for $129) and tacks on a mattress pad, top sheet, and insulated quilt. The R-value of 3.6 translates to insulating you down to roughly 40 degrees, but it can go a bit lower if you layer up or bring along a separate sleeping bag. The biggest drawback of the system is its price, and we’re not convinced the whole set-up justifies the $279 sticker. On the other hand, everything is nicely integrated and fits well. Our only other complaint is that the airbed includes a manual hand pump, which takes a good amount of effort to get fully inflated. It’s definitely not for everyone, but the Kingdom Insulated Sleep System is a great execution of a novel idea, and one of the top airbeds of 2019. Dimensions: 77 x 25 x 3.5 in. Weight: 6 lbs. 11 oz. What we like: Pillow-top foam makes it supremely comfortable. What we don’t: Bulky and expensive. A true 2-in-1 concept, Therm-a-Rest's popular DreamTime is a highly versatile design. The pad features a 2.5-inch self-inflating mattress and separate foam layer which are housed inside a washable microfiber cover for easy maintenance and cleaning (no more scrubbing the dirt off to get the pad ready for the next trip). The top portion of the cover is supremely cozy—it’s our favorite on this list in this respect—and its durable bottom helps protect the mat from possible punctures. And for trips where space is at a premium, you can cut packed size by bringing just the self-inflating portion of the DreamTime. Given the Therm-a-Rest's adaptability, its $200 price tag seems fairly reasonable. That said, the mat is bulkier than much of the competition—at nearly 7 pounds, it’s almost double the weight of many options above and takes up a lot of space when rolled up. Further, the removable mattress is less packable and heavier than the backpacking-ready air pad in the since-discontinued NeoAir Dream. Value-wise, some of the mats above like the Therm-a-Rest MondoKing 3D pack a similar punch for less, but it’s hard to fault the DreamTime’s ease of use and top-notch comfort. Dimensions: 80 x 30 x 15 in. Weight: 19 lbs. 8 oz. What we like: Comfortable and high off the ground. What we don’t: Extremely bulky and heavy. Choosing a cot over a sleeping pad or airbed has its upsides, including no risk of deflation and a sturdy metal structure that gets you off the ground. For camping, our favorite cot is the Coleman Comfortsmart Deluxe: it’s generously sized for one person at 80 inches long and 30 inches wide (the pad itself is slightly smaller), easy to set up, and the coil construction does a fairly decent impression of your bed at home. Taking into account the strong steel frame and squishy foam pad, the all-in price of $48 for the Comfortsmart is excellent. There are a few important considerations when selecting a cot like the Comfortsmart Deluxe for camping. First are the folded dimensions, which measure a trunk-filling 40 x 30 x 5.5 inches. If space is at a premium in your vehicle, a cot pretty much is off the table. The other is the interior dimensions of your tent. Because the cot sits pretty far off the ground (total height is 15 inches), you may hit the sloping walls of a dome-style tent. But for large and vertical camping tents, it’s hard to beat the level of comfort for the price, not to mention the cot can double as a couch. What we like: Light, very packable, and comfortable. What we don’t: Not as durable as a traditional camping mat. For an all-in-one camping and backpacking pad solution, we recommend Therm-a-Rest’s NeoAir Trekker. This pad does a good job of incorporating the durability necessary for camping use without sacrificing weight and packed size. It doesn’t give up much in terms of comfort either with a 2.5-inch thickness and horizontal baffles. Therm-a-Rest recently added a “regular wide” size to the Trekker line-up, measuring 72 by 25 inches, which is great for active sleepers and campers that like to spread out. In playing to both the camping and backpacking crowds, the NeoAir Trekker does come with a few compromises. Campers will want to take additional care to keep the pad from getting punctures. For reference, the Trekker uses a 30-denier top and 70-denier bottom fabric, whereas the MondoKing above uses a tough 75 denier on all sides. And for backpackers, the 18-ounce weight is good but not great. Finally, we’ve found the mat to be quite crinkly—not a big deal for backpacking, but quite noisy compared to other camping mats. But if you’re looking to invest in just one high-quality pad for both purposes, we think the NeoAir Trekker is a worthy choice. What we like: Air sprung cell design offers supreme comfort. What we don’t: Much more expensive than the competition. A few years ago, Sea to Summit shook up the backpacking pad market with their innovative cell-like design, and they’ve recently expanded the line to the camping world. The Comfort Deluxe air pad differentiates itself from the brand’s light and packable models with an extra half inch of thickness and wider and longer size options. What stays the same is the plush and very supportive air sprung construction that appeals to side and back sleepers alike. Truth be told, we’re a little conflicted about Sea to Summit adding this camping version. There’s no questioning its comfort, but the pad’s high price tag, 2-pound 3-ounce weight, and relatively thin construction puts it in an awkward place between the camping and backpacking worlds. The 40-denier fabric won’t hold up well over the long haul, but it still costs at least $50 more and is a pound heavier than many leading backpacking models. Car campers, paddlers, and hikers that only have to carry their gear a short distance may find the Comfort Deluxe interesting, but we think there are more better and more affordable crossover options. Weight: 14 lbs. 13 oz. What we like: Budget-priced airbed. What we don’t: No pump included; a little less comfortable. 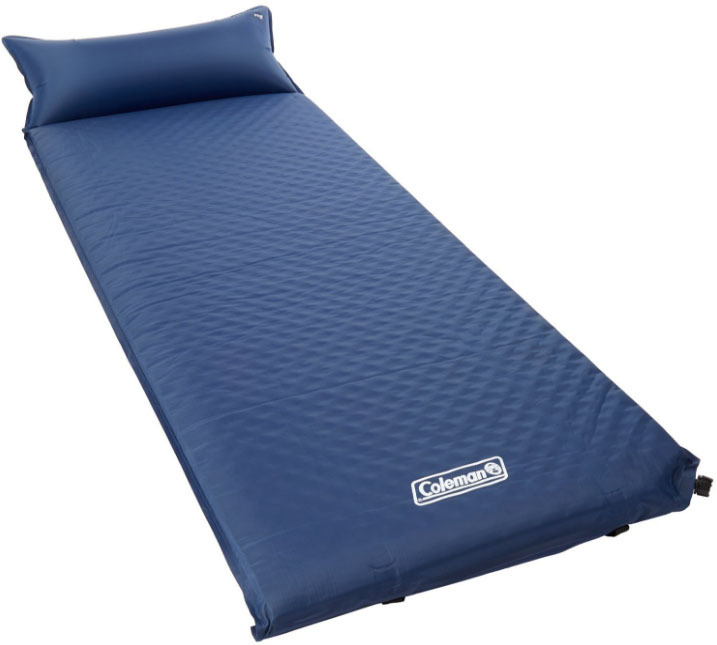 Coleman’s SupportRest Double High is our top value-oriented airbed. Most importantly, in this case opting for a relatively inexpensive design doesn’t make for serious compromises in durability. While no airbed has a perfect track record, the SupportRest has a lot of leak-free nights to its name. The top fabric of the bed is soft and will hold sheets in place, and the Double High compresses down to a reasonable size for storage or transport. Of note: the SupportRest doesn’t include a pump for inflation or deflation—we recommend Coleman’s 4 D Battery Quick Pump for camping use, which adds about $15 to the price. One of the Coleman’s primary competitors is the SoundAsleep airbed above. The Coleman is the clear favorite for those on a budget—even adding the pump undercuts the SoundAsleep in price for either the twin or queen size. And if you prefer the tall, double-high style, the Coleman is more convenient. But we rank the SoundAsleep above the Coleman for its more supportive design that isn’t as prone to sagging, sturdier construction in general, and practical height that fits better in most camping tents. But if your airbed mostly will be used at home and only taken camping on occasion, the Coleman SupportRest is a proven option. Weight: 2 lbs. 9.3 oz. What we like: Extremely warm but still packs down small. What we don’t: Overkill for most 3-season camping trips. Exped’s DownMat XP 9 fills a unique niche with its winter-ready air pad construction. 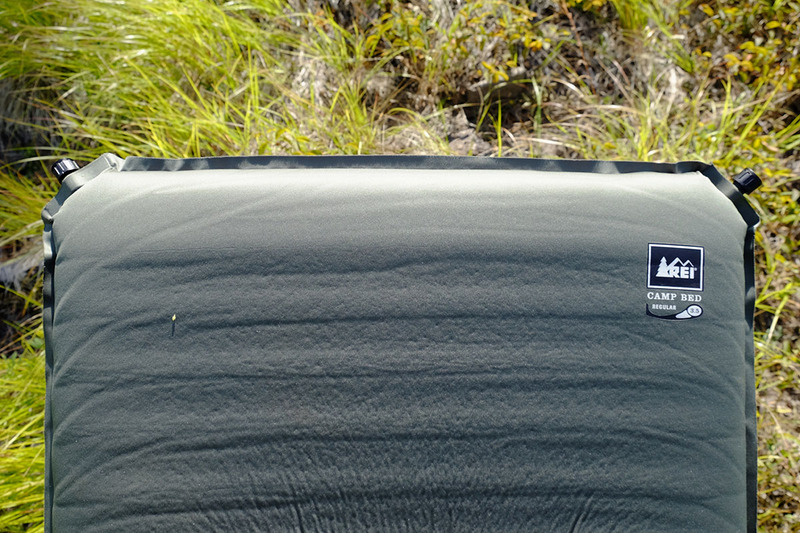 The DownMat is packable and highly insulated (Exped rates it at -36°F) thanks to the 700-fill goose down that is bonded to the interior. And it’s also been built to withstand the rigors of cold-weather use with a tough 75-denier polyester shell that’s reinforced with a TPU laminate. For situations where warmth and packed size are priorities—such as setting up base camp on a mountaineering or ski touring trip—the DownMat is hard to beat. 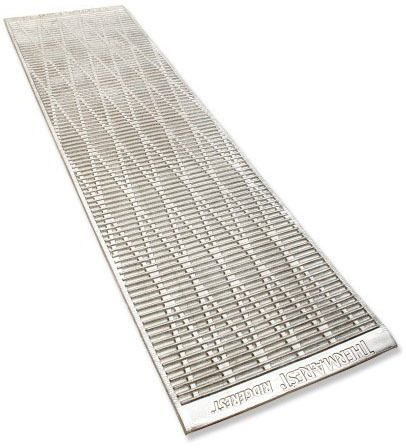 Despite a long track record and plenty of happy customers (us included), the DownMat ends up near the bottom of our list because of its narrow appeal. We leave it behind on 3-season camping adventures, and at 2 pounds 9.3 ounces, the pad isn’t as versatile as the NeoAir Trekker above for mixing in the occasional backpacking trip. Exped does make a lighter version of the DownMat, the HL Winter, but that pad seriously compromises in durability with a 20-denier shell. Weight: 2 lbs. 12 oz. What we like: Therm-a-Rest quality for under $100. What we don’t: You can get similar comfort for cheaper. The BaseCamp from Therm-a-Rest is a solid mid-range camping mat. Most appealing is the price: for under $100, you get Therm-a-Rest build quality and reliability. Its 2-inch thickness falls short of the luxurious MondoKing at the top of our list in terms of comfort, but is a significant step up from a basic backpacking pad or thin mat. 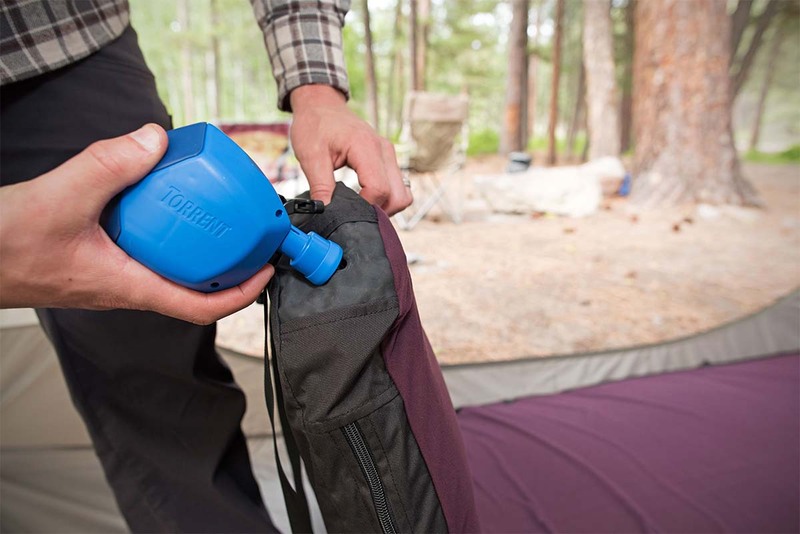 There isn’t anything revolutionary in the design of the BaseCamp, but the self-inflating foam is supportive and the twist valve is easy to use and not prone to leaking. Within the Therm-a-Rest line-up, the BaseCamp is a decent value but we think there are better options on the market. The Alps Mountaineering Apex Series above has a thicker, 3-inch self-inflating construction (in the long size), and feels just as comfortable at about two-thirds the price. Therm-a-Rest usually separates itself from the pack in fit and finish, but we’ve generally been impressed with the Alps Mountaineering mat, which is why it’s overtaken the BaseCamp on our list. 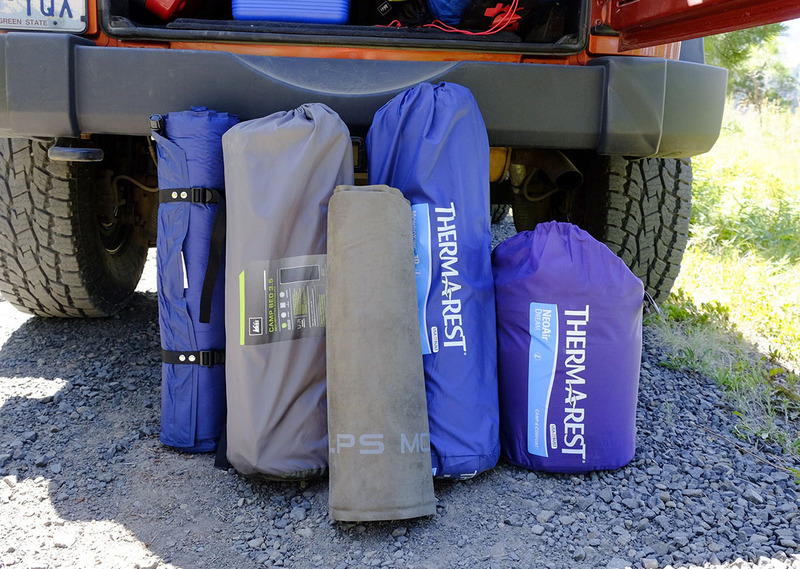 It’s worth noting that Therm-a-Rest is updating the BaseCamp for spring 2019 with a new face fabric, and at the time of publishing, the outgoing model is still widely available on discount. Dimensions: 76 x 26 x 2.5 in. Weight: 4 lbs. 8 oz. What we like: Cheap, decently comfortable, and durable. What we don’t: Slippery top fabric, less comfortable than the pads above. For casual campers that sleep outside once or twice a summer, the Coleman Camp Pad is a durable and very affordable option. At $34, you get self-inflating construction, foam padding, and even a built-in pillow. We didn’t find the pillow very comfortable (it doesn’t have any foam inside and the nylon exterior isn’t soft by any means), but it is nice to have in case you leave yours at home. The 76- by 26-inch sleeping space equals that of the long-size pads above and is plenty roomy for spreading out. Overall comfort is where the Coleman falls short of even the budget-oriented Alps Mountaineering above. In particular, the Camp Pad shell’s plasticky finish makes it slippery and prone to trapping sweat on hot summer nights. As a result, we’d lean toward spending up for the Alps Mountaineering Apex in most cases, but the Coleman is the clear cost leader and still far plusher than your old 0.5-inch foam pad. What we like: Cheap, lightweight, and it can’t deflate on you. What we don’t: It’s the least comfortable option on our list. 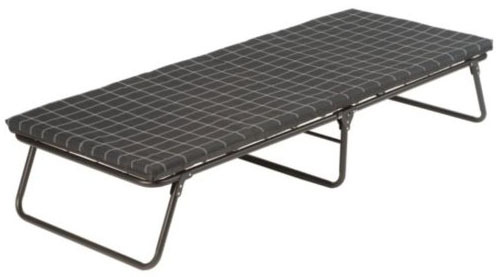 Therm-a-Rest's RidgeRest SOLite is a classic choice for a first backpacking or camping pad. It was (and still is) cheap, reliable, and as simple to set up as laying it on the ground. Unfortunately, the RidgeRest also is kind of bulky and rather uncomfortable. This foam pad is just over a half-inch thick—0.62 inches to be exact—which makes it incapable of disguising a rock, stick, or even large bumps on the ground that you may find yourself sleeping on top of. As such, the RidgeRest’s biggest upsides are simplicity and inability to deflate—it’s a foolproof way to keep yourself protected from the cold ground on a camping trip. If you’re like most campers, we suggest opting for one of the air mats above rather than the RidgeRest. It’s true that it’s hard to beat the value of this pad, but even spending up for the Coleman Camp Pad above—which is often on sale for less than $40—will be worth the investment from a comfort perspective. But if you’re looking for something super simple—and something that a dog or child can’t put a hole in—the RidgeRest remains a viable option. Therm-a-Rest MondoKing 3D $180 Self-inflating 77 x 25 x 4 in. 5 lbs. 8 oz. 9 x 26 in. REI Co-op Camp Bed $100 Self-inflating 72 x 25 x 2.5 in. 3 lbs. 10 oz. 5.5 x 26 in. Alps Mountaineering Apex $74 Self-inflating 72 x 20 x 3 in. 4 lbs. 14 oz. 9 x 22.5 in. SoundAsleep Camping Series $90 Airbed 78 x 60 x 9 in. 14 lbs. 10 x 20 in. Klymit Static V Luxe $80 Air mat 76 x 30 x 3 in. 1 lb. 10.5 oz. 4.5 x 8 in. Exped MegaMat Duo 10 $389 Self-inflating 77 x 52 x 3.9 in. 9 lbs. 15 oz. 12 x 28 in. Nemo Cosmo 3D Insulated $180 Air mat 76 x 25 x 3.5 in. 2 lbs. 10 oz. 7 x 11 in. REI Kingdom Insulated Sleep System $279 Airbed 79 x 56 x 6 in. 15 lbs. 9 oz. 17 x 21 x 23 in. Therm-a-Rest DreamTime $200 Self-inflating 77 x 25 x 3.5 in. 6 lbs. 11 oz. 10 x 26 in. Coleman ComfortSmart Deluxe Cot $48 Cot 80 x 30 x 15 in. 19 lbs. 8 oz. 40 x 30 x 5.5 in. 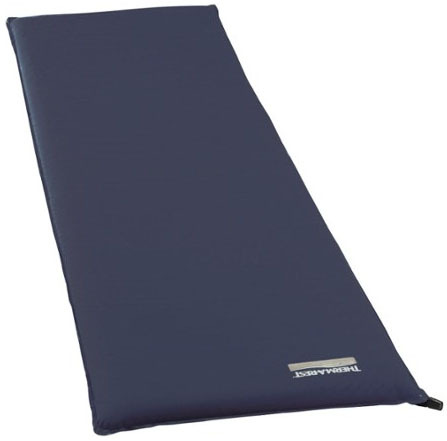 Therm-a-Rest NeoAir Trekker $130 Air mat 72 x 20 x 2.5 in. 1 lbs. 2 oz. 4.5 x 9 in. Sea to Summit Comfort Deluxe $240 Air mat 73 x 25 x 3 in. 2 lbs. 3 oz. 5.5 x 10 in. Coleman SupportRest Double High $70 Airbed 78 x 60 x 18 in. 14 lbs. 13 oz. 12 x 17 in. 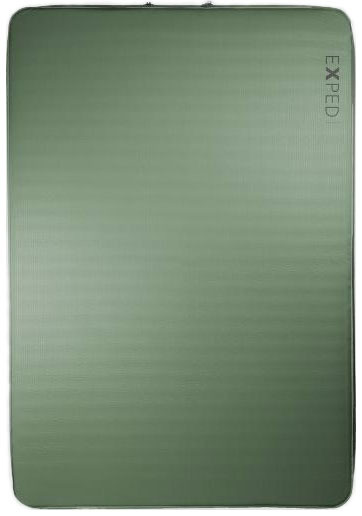 Exped DownMat XP 9 $249 Air mat 77 x 25 x 3.5 in. 2 lbs. 9.3 oz. 6.3 x 10.6 in. Therm-a-Rest BaseCamp $90 Self-inflating 77 x 25 x 2 in. 2 lbs. 12 oz. 5 x 26 in. Coleman Camp Pad $34 Self-inflating 76 x 26 x 2.5 in. 4 lbs. 8 oz. 8 x 26 in. Therm-a-Rest RidgeRest SOLite $30 Foam 72 x 20 x .62 in. 14 oz. 8 x 20 in. Therm-a-Rest released the first self-inflating mattress in the early 1970s, and the same basic design has soldiered on for years. 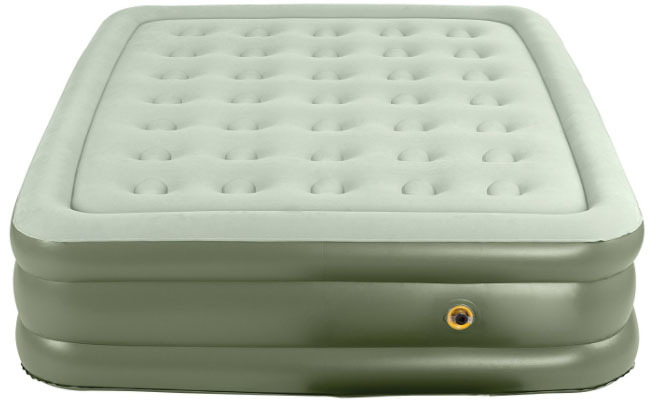 The interior of these mattresses is filled with an open-cell foam that expands and fills with air when you open the valve (hence the name "self-inflating"). In comparison to a pure air mattresses, a self-inflating mat has a cushier feel thanks to the foam, although it doesn’t compress as small and is heavier. For camping when comfort is more important than weight and packed size, self-inflating mattresses are our favorites. It's no coincidence the plush Therm-a-Rest MondoKing 3D tops our list. As the name implies, an air mattress is filled almost entirely with air. Inflating these mats requires you to either blow air through a valve or use a pump. What you gain is weight savings: at a given thickness, an air mat might weigh half or even less than a comparable self-inflating mattress. Moreover, air mattresses are the most compressible pad option. Even insulated models with synthetic or down-fill bonded to the interior can be rolled into a compact size, which makes storage and transport very easy. This is great for backpacking, but overall comfort does fall short compared with a self-inflating pad. Air mats lack the squishy and supportive feel that you get with foam. Your classic sleeping mat is made of closed-cell foam. These pads don’t require any inflating to set up—just unroll it and you’re done. The big upside is there’s no risk of getting a puncture, but closed-cell foam is by far and away the least comfortable mattress type. They are very thin (less than 1 inch vs. 2 inches or more for a self-inflating or air mat) so they can’t disguise bumps in the ground beneath you. But if you’re the type that can comfortably crash on a friend’s floor—and we mean directly on the floor—save yourself some coin and get the Therm-a-Rest RidgeRest. This pad will set you back $30 and offer all the comfort your steel body requires. If you’re like the rest of us, one of the other pads from our list above will suit you much better. With plenty of sleeping space in your camping tent, you may have the luxury to decide between a traditional sleeping mattress or a full-on blow up airbed. So which one should you choose? The main benefit of an airbed is it gets you further off the ground for easier in and out (a cot can do the same). Further, the large size is great for couples, families, or if you just like to spread out. And if you’re trying to save some dough, airbeds are friendlier for use at home for guests, especially if you choose a two-person queen-sized airbed. In terms of comfort, however, we give the standard sleeping mat the upside, particularly those that have foam in the construction. One exception is the all-in-one REI Kingdom Sleep System. The combination of an airbed, mattress pad, and quilt is pretty hard to beat. A cot may stretch the definition of a sleeping mattress—considering it comes with a metal structure in addition to a sleeping platform—but it’s a viable and quite popular way of sleeping in a tent. We love cots because they get you high off the ground, and they can double as a couch for hanging out during the day. Comfort-wise, they usually fall in the mid-range. 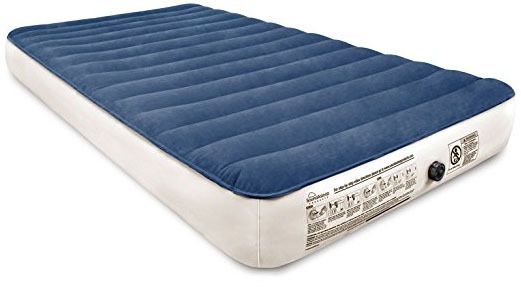 The Coleman Comfortsmart Deluxe that we’ve included above is reasonably soft, but it still falls short of a quality self-inflating mat. On the other hand, a cot like the Coleman is a great value at around $50. The most important consideration is whether you can transport the cot and fit it inside your tent. Most cots only fold in half, so they are extremely large (the Comfortsmart measures 40 x 30 x 5.5 inches when folded). If you’re bringing a few cots, it may be impossible to squeeze everything into your vehicle. And inside your tent, the tall height of the cot may run into the sloped walls. But if you have the space and are willing to haul it around, a cot can be a great choice for camping. In the same way buying your mattress at home is a personal decision, not everyone will agree on which camping mattress type is best. The good news is that most quality mattresses are in fact quite comfortable. We give the edge to self-inflating pads for the cushy but supportive foam that makes them a little more comfortable to us, but back sleepers, side sleepers, and even stomach sleepers should be happy with most of the models that made out list. For some general guidelines regarding pad thickness, side sleeping puts a higher percentage of weight around the hips and shoulders, so a pad or airbed that’s 3 inches thick or more is advisable. Back sleepers—depending on personal preferences—can get away with a thinner pad like the 2-inch thick Therm-a-Rest BaseCamp. And if you're a finicky sleeper, it's not a bad idea to upgrade to a premium pad like the 4-inch thick Therm-a-Rest MondoKing. It's true that tolerant sleepers can deal with less, but if you camp out a lot, it's often worth the investment. In the spirit of comfort, camping pads and mattresses have a much larger footprint than their backpacking cousins. Some are offered in the smaller 72-inch length, but many start at approximately 77 inches, and extend to 80 to 85 inches (the XXL version of the Therm-a-Rest MondoKing 3D is 80 x 30 inches). The longer length is great for taller folks, but just about everyone can appreciate the extra width. 20-inch pads are standard fare for backpacking and usually mean at least one arm is sliding off the pad during the night. The 25 or 30-inch widths you get with a camping pad (extending as wide as 60-inches for a queen-size airbed) are a welcome relief and can make a real difference in nighttime comfort. Active sleepers that roll around in their sleeping bag will also appreciate the additional space. A camping mattress’ ability to insulate you from the cold ground is measured in R-value, and a higher number indicates better protection. Not all manufacturers provide the spec, but it's a helpful tool when available. In the heat of summer, you can get away with almost no insulation in most cases (for example, the Klymit Static V Luxe with a 1.3 R-value). For 3-season use, we recommend getting a pad with at least an R-value of 3. If you’ll be out in the winter, potentially sleeping on top of snow, get a mattress with a rating above 5. And for these conditions, it’s often a good idea to combine your inflatable mattress with a foam pad, not only for a boost in insulation, but also a level of security should your inflatable pad spring a leak. Camping is typically a drive up and unload kind of activity, so the weight and packed size of your gear isn’t always the number one consideration. And in choosing your camping gear, it’s almost always worth taking the more comfortable and durable route rather than the lightest or most compressible. That said, if you don’t have a whole lot of extra space in your rig (or home for long-term storage), it’s worth checking the specs before buying a massive camp bed. For example, the Coleman Comfortsmart Cot measures an immense 40 x 30 x 5.5 inches and weighs nearly 20 pounds. Just a couple of those will fill up a car on their own. On the other extreme is a backpacking-ready design like the Therm-a-Rest NeoAir Trekker at 4.5 x 9 inches and 1 pound 2 ounces. The sweet spot for comfort, durability, and practicality is somewhere in between for most campers. With weight out of the equation, most camping mattresses are very durable. Their thick fabrics are far less likely to get a puncture or spring a leak than a backpacking model, which is nice if you plan to sleep outside without a tent or have dogs. There are, however, still differences between models, which is why we suggest checking the denier ratings (if available). For camping mats, denier ranges from about 50D to 150D, with the higher numbers offering greater tear resistance. The underside of a pad often gets the most abuse, so we prefer a slightly thicker bottom fabric. That being said, the 75-denier fabric bottom on our MondoKing is plenty durable and we’ve had no hesitations laying it directly on dirt. The majority of camping mattresses are self-inflating and utilize a familiar twist valve. Opening the valve allows the pad to work its self-inflating magic and expand the foam. Depending on the model, you may or may not need to blow a few extra breaths to get the mat fully inflated. We’ve found that the quality of the valves does vary by price, and budget pads like the Coleman Camp Pad have a flimsier plastic than premium options from REI or Therm-a-Rest, which impacts long-term durability. In addition, some of the large self-inflating pads, like the Exped MegaMat or Therm-a-Rest MondoKing, have 2 valves to shorten inflation and deflation times. Having to manually inflate a large air pad or airbed can be a time consuming and dizzying experience (or an impossible task in the case of an airbed), so most manufacturers will include some sort of pump. Nemo’s Cosmo 3D Insulated pads have a built-in pump at the foot-end of the pad that you inflate by pushing down with your feet. And the SoundAsleep Camping Series Airbed comes with a rechargeable pump, which is easy to attach and use. These pumps aren't as simple as a self-inflating design, but they fully inflate their respective sleeping mats in only a few minutes. Sleeping pads designed for backpacking are about keeping weight as low as possible, while retaining enough warmth and comfort. The downside of then using your lightweight backpacking pad while camping is that it’s another opportunity for the thin fabrics to spring a leak. It’s strange to say, but we’ve found that the easygoing camping life can actually be more damaging to your lightweight gear than being in the backcountry. Whatever the reason, we’ve had backpacking pads that never leaked catch a dog’s nail or other hazard and deflate on the simplest of camping trips. We do understand the financial motivation to only purchase a single pad, and there are options that crossover nicely. 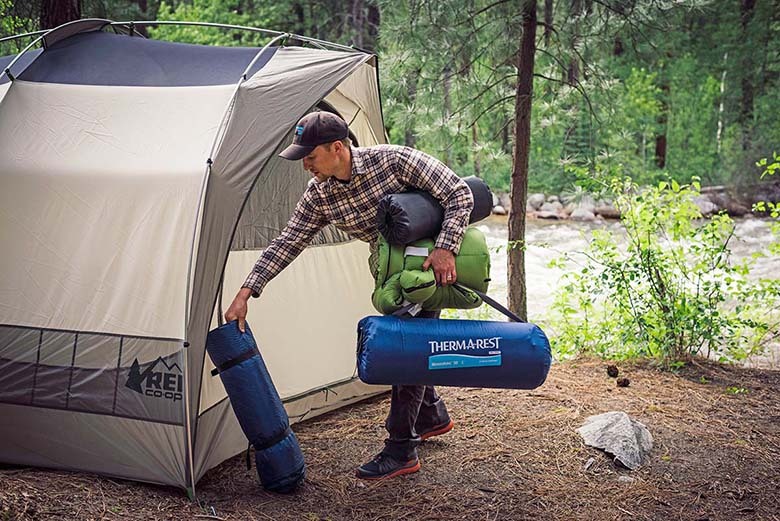 Of the mattresses that are most comfortable for camping, we recommend the Nemo Cosmo 3D Insulated (but in the narrower 20-inch width) or the Therm-a-Rest NeoAir Trekker. For a full list of our recommendations, see our article on the best backpacking sleeping pads.